Sempu Island is a small island located south of Java Island. The island is located in Malang regency, East Java. Currently Sempu the nature reserve is protected by the government. In this island could hardly be found in brackish water. Geographically, Sempu Island lies between 112 ° 40 '45 "- 112 ° 42' 45" east longitude and 8 ° 27 '24 "- 8 ° 24' 54" south latitude. The island had a total of approximately 877 hectares, bordering the Strait Sempu (Spring Blue) and surrounded on the south side of the Indian Ocean, East and West. Sempu Island can be reached from Malang by Blue Spring Beach, and pedestrian use fishing boats, and get licenses. Leaving at night from Surabaya takes about 3.5 hours to four hours to reach the beach area Sendangbiru, Malang. Travel at night is clearly more to save time, because the road was clear. After Malang and passed Kepanjen, roads are not too wide, and started many farming areas, and occasionally through the countryside which is not too large. Especially if you travel at night to coincide with full moon would be giving the impression of beauty in itself. Approaching Sendangbiru little street paved road narrows and then gone right on Beach Sendangbiru. If bringing their own vehicles can park on the shore and immediately opened a tent on the beach area that is filled with tiny outrigger boats, motorized passenger boat, and fishing boats. From Coast blue spring we can rent boats for 40rb (commute) to take across to the Island Sempu with a maximum capacity of 15 people. Other beauty can be found on the island Sempu is how could swim in water that is very clear (in the immediate tillers) and to have a hobby can be freely enjoyed snorkeling the underwater scenery because this place ever so civilizing coral reef without fear swept waves. 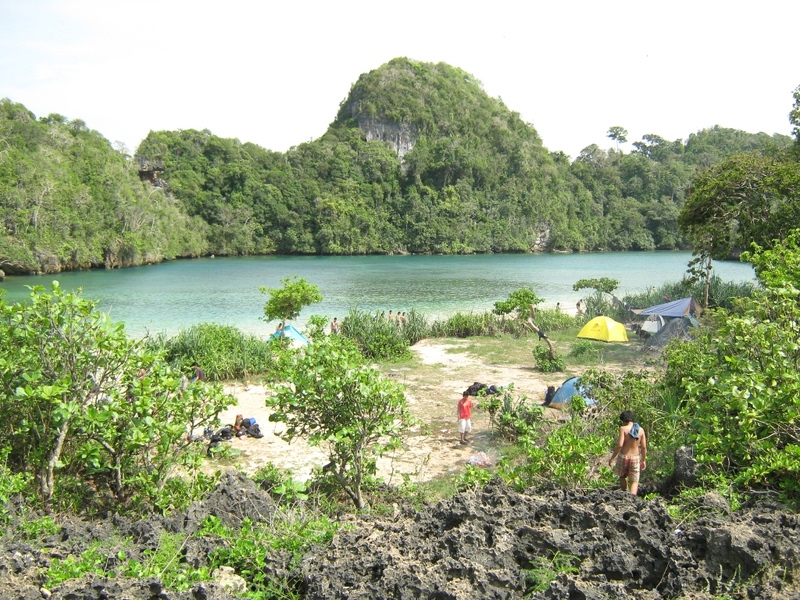 In the lake there Sempu called “Segara Anakan”. 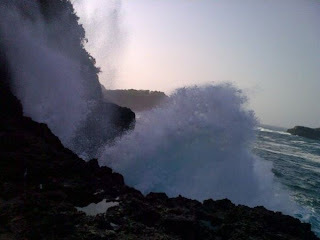 This place is more like a small lake surrounded by high rocks that restrict the open sea, Southern is Indonesia Ocean with huge rippled .Supply water into this lake from a large hollow rock in the middle, which periodically provides a great view of water splash-splash sound of waves hitting the reef. Some water was flowing into Segara Anakan. In addition to this giant swimming, visitors can also relax by playing beach volleyball. For those who love the natural atmosphere of the original, far from the noise of modern life, providing solutions Sempu Island, just did not expect five-star hotel there, other than that brought his own bed. One also can climb the rock which surrounds ly, from the rocks we could see the sea waves that erode terbing2 giant, very beautiful indeed.